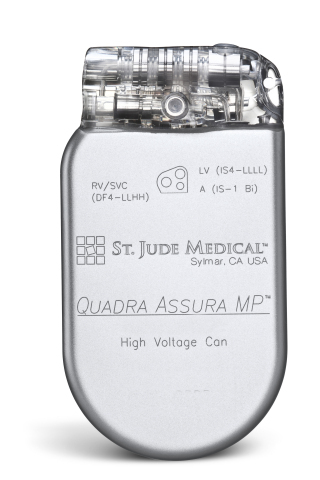 St. Jude Medical, Inc. (NYSE:STJ), a global medical device company, recently received U.S. Food and Drug Administration (FDA) approval of the company's proprietary, first-to-market MultiPoint™ Pacing technology and today announced the U.S. launch and first U.S. implants of the Quadra Assura MP ™ cardiac resynchronization therapy defibrillator (CRT-D). MultiPoint Pacing technology is a revolutionary approach designed for CRT patients who are not responsive to other pacing options. The first implant took place at Saint Francis Hospital in Hartford, Conn. Speaking about the opportunity, Dr. Neal Lippman, electrophysiologist with Arrhythmia Consultants of Connecticut at Saint Francis said, "We are now able to offer St. Jude Medical's new MultiPoint Pacing technology for our patients whose heart failure condition is difficult to manage. It is important for us to have this option to individualize patient care and help improve response to therapy." Despite the improvements in patient outcomes seen with quadripolar CRT technology, a small, but important group of patients do not respond optimally to the therapy. Importantly, these "non-responders" to CRT cannot be identified at the time of implant and how effective the therapy will be in addressing an individual patient's heart failure symptoms can be unpredictable. MultiPoint Pacing technology offers physicians a new set of tools that allow for individualized patient therapy with the goal of optimizing their response to CRT. "St. Jude Medical developed and established a new standard of care for CRT with quadripolar pacing. We are excited to bring the next-generation MultiPoint Pacing technology to market, giving physicians additional options to improve patient response," said Dr. Mark D. Carlson, vice president of global clinical affairs and chief medical officer at St. Jude Medical. Cardiac resynchronization therapy includes a lead ( Quartet™ Quadripolar LV Lead) placed on the lower left chamber of the heart (ventricle). The left ventricle pumps oxygenated blood from the heart out to the rest of the body. MultiPoint Pacing technology is designed to deliver electrical pulses to multiple locations on the Quartet lead to make the heart's lower chambers pump in a more coordinated way to mirror the natural contractions of a healthy heart. According to the American Heart Association, CRT can improve the heart's efficiency at pumping blood to the body and can lessen symptoms of heart failure, including shortness of breath. However, even with effective placement of the leads around the heart, therapy can be unpredictable and ineffective for some patients. MultiPoint Pacing technology allows physicians to program the device to stimulate more left-ventricular tissue at one time by pacing at multiple locations in the heart, more similar to the natural electrical behavior of the heart. Over 60 abstracts and publications demonstrate that this increases the number of patients who benefit from this type of therapy (CRT). A recent study demonstrated that the St. Jude Medical MultiPoint Pacing technology may be particularly beneficial in patients not responding to traditional bi-ventricular pacing therapy, which accounts for approximately one third of the total population of patients receiving CRT. In this study, MultiPoint Pacing technology realized a 90 percent responder rate for patients with MultiPoint Pacing at one year compared to traditional methods of CRT. Several ongoing studies continue to build the body of evidence and examine the benefits patients receive from MultiPoint Pacing including the St. Jude Medical MORE CRT MPP clinical study, designed to demonstrate the benefits of the St. Jude Medical MultiPoint Pacing technology in improving patient response to CRT therapy. Data from the MultiPoint Pacing Investigational Device Exemption (IDE) study will be presented during a late-breaking clinical trial session during the Heart Rhythm Society's (HRS) 37th annual scientific sessions, May 4 - 7 in San Francisco. Approximately 23 million people worldwide are afflicted with congestive heart failure and 2 million new cases are diagnosed worldwide each year. Studies have shown that CRT can improve the quality of life for many patients with heart failure, a progressive condition in which the heart weakens and loses its ability to pump an adequate supply of blood. The CRT technology resynchronizes the lower chambers (ventricles) of the heart by sending uniquely programmed electrical impulses to stimulate each ventricle to beat in sync for optimal cardiac performance. St. Jude Medical developed and launched the industry's first quadripolar pacing system in the United States in 2011 featuring four pacing electrodes, offering physicians the ability to effectively and efficiently manage the ever-changing needs of patients with heart failure. The Quartet LV lead design allows the physician to implant the lead in the most stable position without making trade-offs in electrical performance; this also reduces the likelihood of costly and invasive lead revision through a second intervention procedure. Adding MultiPoint Pacing technology and additional lead sizes to the quadripolar offerings provides physicians more advanced options to optimize CRT performance, such as improving hemodynamics, resynchronization and reverse remodeling of the heart. St. Jude Medical is pioneering heart failure disease management with innovative solutions like the CardioMEMS ™ HF System, ground-breaking quadripolar technology and, in select European markets, the HeartMate 3 ™ left ventricular assist system and our first-to-market MultiPoint pacing technology. St. Jude Medical collaborates with heart failure specialists, clinicians and advocacy partners to provide innovative, cost-effective solutions that help reduce hospitalizations and improve patient quality of life for heart failure patients around the world. For more information about St. Jude Medical's focus on heart failure, visit the St. Jude Medical Heart Failure Media Kit or the St. Jude Medical PULSE Blog. Information for patients to learn more about heart failure can be found at www.heartfailureanswers.com. St. Jude Medical is a leading global medical device manufacturer and is dedicated to transforming the treatment of some of the world's most expensive epidemic diseases. The company does this by developing cost-effective medical technologies that save and improve lives of patients around the world. Headquartered in St. Paul, Minn., St. Jude Medical has five major areas of focus that include heart failure, atrial fibrillation, neuromodulation, traditional cardiac rhythm management, and cardiovascular. For more information, please visit sjm.com or follow us on Twitter @SJM_Media. This news release contains forward-looking statements within the meaning of the Private Securities Litigation Reform Act of 1995 that involve risks and uncertainties. Such forward-looking statements include the expectations, plans and prospects for the Company, including potential clinical successes, reimbursement strategies, anticipated regulatory approvals and future product launches, and projected revenues, margins, earnings and market shares. The statements made by the Company are based upon management's current expectations and are subject to certain risks and uncertainties that could cause actual results to differ materially from those described in the forward-looking statements. These risks and uncertainties include market conditions and other factors beyond the Company's control and the risk factors and other cautionary statements described in the Company's filings with the SEC, including those described in the Risk Factors and Cautionary Statements sections of the Company's Annual Report on Form 10-K for the fiscal year ended January 2, 2016. The Company does not intend to update these statements and undertakes no duty to any person to provide any such update under any circumstance.